It’s Heat Exchanger Inspection Time! Fall 2015’s kickoff is the perfect time to have the HVAC system’s heat exchanger inspected. It is a central part of standard, HVAC systems. Material must enter and exit the exchanger properly in order for the system to be effective. And that goes for both heating and cooling modes, which is why the cusp of a new season is always a great time to have it inspected. 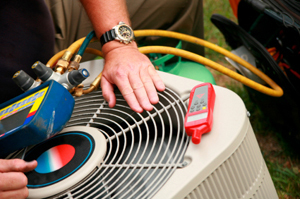 Inspection services allow HVAC professionals to ensure that hot air will flow into the building’s interior during the fall season and not out, as it does throughout the summer. Naturally, that doesn’t mean that the air conditioning portion of the property’s system will stop working. It won’t unless there is something wrong with it. In which case, HVAC professionals’ repair services would come into play. Because a HVAC system’s heat exchangers work so hard year round, they tend to sustain anywhere from minor to major damage. For instance, the walls of the exchanger may weaken or become covered with substances that slow down the transfer of heat. Thus, HVAC professionals would likely have to replace or clean the heat exchanger in order to boost performance. Inspection of the HVAC system’s remaining components would likely follow because they obviously depend on the heater exchanger. As such, damage to the exchanger would invariably have a domino effect over time. After a thorough look around, professionals would probably go ahead and restore power to the system. To have a HVAC system’s heat exchanger inspected in the days to come, please contact us. At Wayne Price Heating and Air Conditioning, our goal is to always provide 100 percent customer satisfaction! Heater Checkups are Now Being Scheduled!